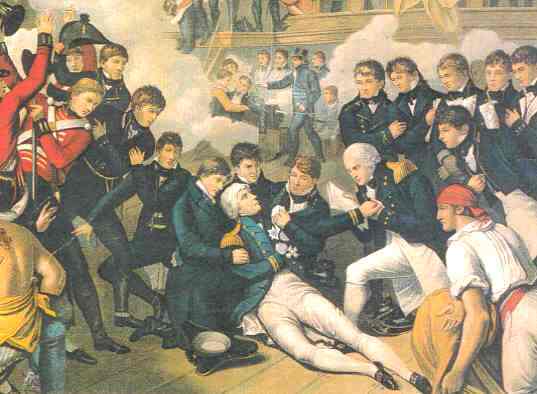 The images of the death of Admiral Horatio Nelson aboard the HMS Victory at the Battle of Trafalgar are well known. Many people associate Nelson’s death with his final words ‘Kiss me Hardy” that were addressed to Captain Thomas Hardy, but the man usually portrayed to the left of Nelson, in whose arms he died, was his close friend and personal chaplain Alexander John Scott. Alexander John Scott was born at Rotherhithe on the 23rd July 1768. His parents were Robert Scott, a retired naval officer, and his wife Jane (nee Comyn). Jane Comyn had brought to the marriage, as a dowry, a small estate in Dominica. When Scott was two years old his father went to visit this estate and not only found it to be worthless but also contracted a tropical disease from which he died, leaving Jane a widow with three young children and in financial difficulties. Scott’s uncle, also called Alexander, who was his father’s brother and a naval commander, took his young nephew with him when he sailed to the West Indies. There, Scott lived with Sir Ralph and Lady Payne. Sir Ralph Payne was the governor of the Leeward Islands and he procured a scholarship for Scott to return to England to be educated at Charterhouse and then at St John’s College Cambridge where he studied divinity. Here he was in the company of more affluent friends and he lived beyond his means and ran up debts. He graduated in 1786 and was ordained as a deacon to a curacy in Sussex but his debts were a pressing concern and, as his uncle refused to give him any more financial support, he accepted the offer of the post as chaplain aboard the HMS Berwick from the captain, Sir John Collins, who was an old friend of his late father. Serving in the Mediterranean gave him the opportunity to hone his skills as a talented linguist and he became fluent in Italian, Spanish, German and French. It was also around this time that he met Horatio Nelson and they became friends. He served as a chaplain on various ships, where his linguistic skills were put to good use as a translator, interpreter and a spy who listened to conversations in foreign ports. He paid off his debts and became financially secure for the first time, although his life was not an entirely easy one. In 1803, when he was aboard the Topaze in the West Indies, he was struck by lightning whilst asleep in his cabin and seriously injured. The bolt ignited some explosives that were stored nearby and the resulting explosion knocked out several of his teeth and damaged his hearing and eyesight as well as leaving him affected by his nerves. He took a while to recover and when he was well enough he returned home to take up a living at Southminster. During his convalescence he was visited by Nelson who asked if he would serve as his chaplain. Just as Scott was recovering his health the war with France was declared and he sailed on the Victory with his friend. On 21st October 1805 the enemy fleet was sighted off Cape Trafalgar and as battle commenced it was Alexander Scott’s role to remain below in the cockpit to minister to the wounded and the dying. It was here that Nelson was brought after being shot by a musket ball, fired from a French ship, at about 1.15pm. Scott stayed with his friend, rubbing his chest to help ease his pain and giving him lemonade to drink, until he finally died in his arms at about 4.30 pm. According to Scott the Admiral’s last words were ‘God and my country’. The only public recognition of his services was the degree of DD (Doctor of Divinity) that was conferred on him by Cambridge. The admiralty refused to acknowledge the part he had played in gathering covert information and even stopped his pay for the time he was absent from his ship on ‘leave’. Scott settled down as the vicar of Southminster, in Essex, on a reduced income. On 9th July 1807, at the age of 35 years, Scott married 17 year old Mary Frances Ryder. He had been friends with the Ryders from his schooldays although they tried to dissuade their daughter from the marriage on the grounds of Scott’s ill health and poor prospects, but she was determined to become his wife. The couple moved into the vicarage at Burnham on Crouch where Scott assumed the curacy to supplement his income as Rector of Southminster. They had two daughters, Horatia and Margaret and then a son who died shortly after birth followed by his mother not long after. Alexander Scott brought up his two daughters alone and campaigned for better education and schools for both boys and girls. In 1816 he received the living at Catterick, although he arrived to find the vicarage in a dilapidated state and the bills unpaid. Here he spent much of his time reading and researching. 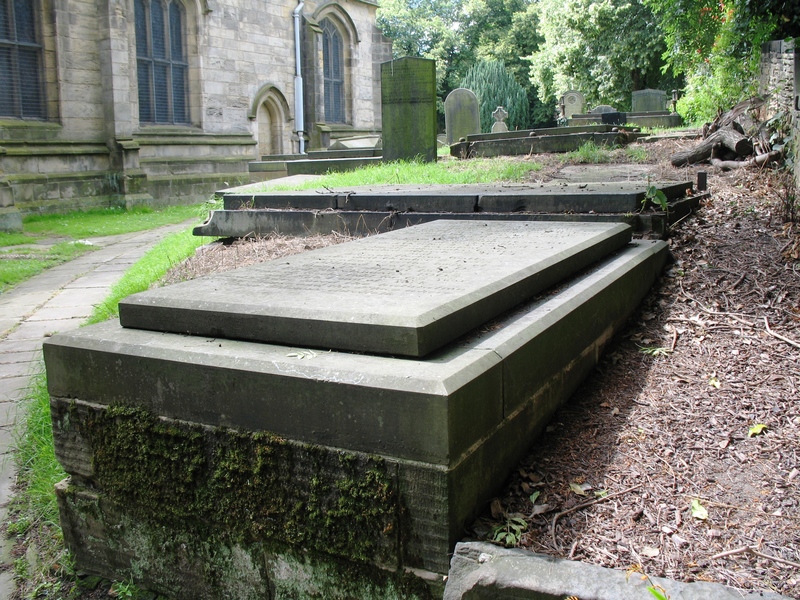 ‘Waiting for the adoption – the redemption of our body’ Here lies buried, Alexander John Scott DD, vicar of Catterick and Southminster and Chaplain to Admiral Lord Nelson on board HMS Victory at Trafalgar. He died July 24 1840 aged 72.